You know the kind of lady I'm talking about. The one that has long braided hair, makes you call her Aunt whateverhernameis, wears a lot of turquoise, makes dream catchers, lives alone, calls her mom "Mother," lives off the land, makes compost, and has 80 cats named after authors, musicians, and words from the French language or founders of Scientology. 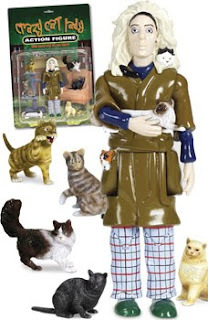 The cat lady action figure. I wonder if this she fights feline crime. Whatever this lady's agenda, I have a distinct feeling it's one day going to be mine. 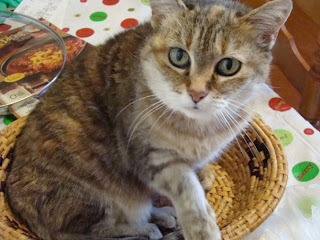 Whether I like cats or not, it may not matter. Things can get desperate, and if you've reached a certain point of crazy being getting rejected by moody cats probably doesn't seem like your biggest problem. So...tell your guy friends I'm single and ready to mingle, otherwise if you have a pet dander allergy we may not be able to be friends in the future. if you become a cat lady, our friendship is over. my pledges dont like cats.